Former 76er’s guard Andre Miller had a career night with 52 points and he led the Blazers pasted Dirk and the Mavericks last night. Besides his first shot, Miller went 22-31 in the big overtime win. 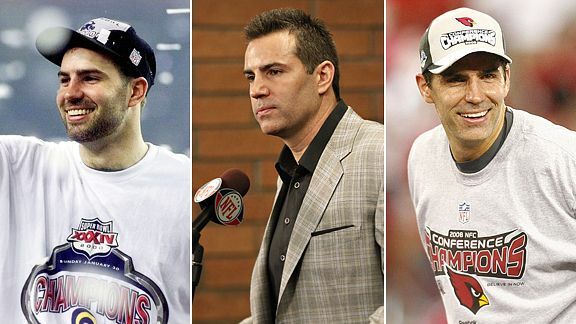 After 12 seasons, QB Kurt Warner has officially announced his retirement from the National Football League. He played most of years with the St. Louis Rams and the final few years with the Arizona Cardinals. Check out some hot pieces from the Nike SB line dropping next month! Yet another hot Air Jordan release for 2010 is the Air Jordan Retro XI in the cool grey colorway. The sneakers originally released in 2001. Another reported release for Holiday 2010 is the Air Jordan Retro XI Snakeskin Low. Another fire torch being thrown at us for 2010. No words on exact release date or price. Well this is crazy news but SneakersNews is reporting that the Air Jordan Retro II will be releasing in the white and cement grey colorway this year. These sneakers are infamous and exciting news for Jordanheads around the world. No specific release date set. Check out the Air Jordan Retro VI in the LA Lakers colorway. It it mainly black, but does have purple and gold in the sneaker as well. What do you think? Finally a view at the Dwayne Wade PE’s of the Air Jordan 2010. Nothing special but they look alright.